Bashundhara Oil and Gas Company Ltd has signed an agreement with Vina Mekong Consultants JSC, Vietnam for having done the soil treatment work at its petrochemical complex at Sitakunda in Chattogram. Representatives of the two companies signed the agreement at Bashundhara Industrial Headquarters-2 in the capital on Wednesday. Bashundhara Group Chairman Ahmed Akbar Sobhan was present at the signing ceremony. Under the agreement, the Vietnamese company will do the ground improvement and soil treatment work at the petrochemical complex of Bashundhara Oil and Gas Company Ltd, a concern of the country’s largest industrial conglomerate Bashundhara Group. The logo unveiling ceremony of ‘Bangabandhu Cup Golf Open 2019’ of Asian Tour was held at Kurmitola Golf Club (KGC) in Dhaka on Thursday. For the first time in the history of Bangladesh Golf, the Asian Tour Golf event has been named after Father of the Nation Bangabandhu Sheikh Mujibur Rahman. Chief of Army Staff General Aziz Ahmed who is also Bangladesh Golf Federation President was present as the chief guest during the logo unveiling ceremony. Bashundhara Group Chairman Ahmed Akbar Sobhan and Vice-Chairman Safwan Sobhan Tasvir were present at the function as the special guests. Bashundhara Group, country’s largest business conglomerate was the title sponsor of the international professional golf event in the three previous editions. Bollywood superstar Sanjay Dutt graced the event as the main attraction at the programme. The tournament was earlier known as Bashundhara Bangladesh Open. Singaporean golfer Mardan Mamat capped the first Bashundhara Bangladesh Open title in 2015 whereas Thailand’s Thitiphun Chuayprakong won the 2nd Bashundhara Bangladesh Open in 2016. Thailand’s Golfer Jazz Janewatta-nanond clinched the 3rd Bashundhara Bangladesh Open in 2017. Bashundhara Group Chairman Ahmed Akbar Sobhan on Thursday said Bashundhara will never compromise with the quality of food items. Reiterating the group’s firm stance against food adulteration, the Bashundhara Group chairman urged food producers to combat food adulteration which led people to different diseases. He was addressing a dealers’ conference of Bashundhara Food and Beverage Limited (BFBL) at International Convention City Bashundhara (ICCB) in the capital as the chief guest. Bashundhara Group Vice Chairman Shafiat Sobhan Sanvir was present on the occasion. Akbar Sobhan further said, “Bashundhara never compromise on product quality. We started cement production in 1992 which is now being used in the construction of mega projects like Padma Bridge and Rooppur Nuclear Power Plant due to its high quality”. Likewise, BFBL has been producing flours from the best corns and through a more subtle and sophisticated process, added the business leader. Urging businessmen to raise a social movement for promoting safe food for all, the Bashundhara Group chief said, “Those who do business with us are the members of our family. We all should enforce ethical standards in business. We will never take advantage of people’s helplessness. Bashundhara will keep food prices stable during natural disasters”. Appreciating the government’s pro-business policies, Ahmed Akbar Sobhan said the present government is supporting the businessmen who have been contributing to nation-building by creating new jobs. On the occasion, a total of 78 dealers of BFBL were awarded prizes for their extraordinary performance. Bangladesh Pratidin, the highest-circulated newspaper in the country, celebrated its ninth founding anniversary amid colorful programmes at International Convention City Bashundhara (ICCB) in the capital on Saturday. On the occasion, five eminent personalities were honored for their outstanding contributions to their respective fields. Well-wishers and readers of the daily attended the programmes and shared the joy of the daily’s success in the last nine years. The presence of a galaxy of personalities, including ministers, politicians, academics, celebrities, businesspersons, media personalities and other members of civil society adorned the event. Attending the programme as the chief guest Speaker Dr Shirin Sharmin Chaudhury said: “Bangladesh Pratidin reflects the views of all people across the country. The newspaper has won the people’s heart by providing authentic news regularly”. She urged the newsmen to pursue constructive journalism and uphold the democratic value in the country. “Besides practising objective journalism, media can play a vital role in upholding the country’s image through projection of its culture, traditions, history and heritage,” she said. The Speaker appreciated the role of the newspaper in raising social movement against all the evils in the country. Bashundhara Group Chairman Ahmed Akbar Sobhan said Bangladesh Pratidin along with other media outlets of East West Media Group (EWMGL) upholds the sprits of glorious liberation war and independence. “We project positive and success stories of Bangladesh across the world by means of media. Once a section of people termed Bangladesh bottomless basket, but now the country is rapidly moving towards development, proving the statement false,“ he said. The Bashundhara Group chairman urged all the media outlets to present the glorious history of the country’s liberation war and independence to the members of young generation so that they become inspired by a sense of patriotism to work in the greater interest of the country. Distinguished guests, eminent personalities, well-wishers and readers started to arrive at ICCB from morning. Bangladesh Pratidin Editor Naem Nizam received the floral wreaths from the guests and well-wishers of the daily. Shaban Mahmood, special correspondent of the newspaper, moderated the event. 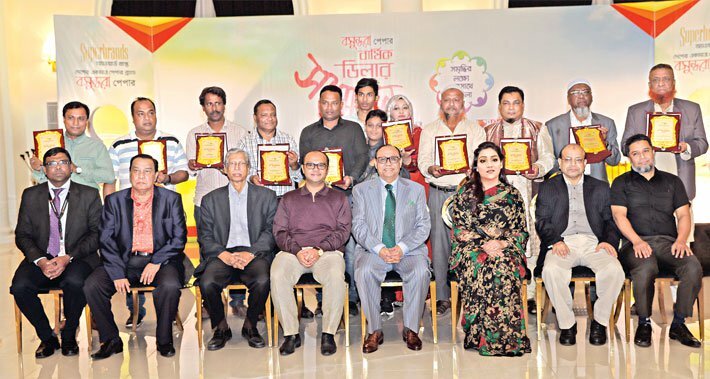 In presence of Bashundhara Group Chairman Ahmed Akbar Sobhan, Speaker Dr Shirin Sharmin Chowdhury handed over awards to the five noted personalities. Dhaka North City Mayor (DNCC) Atiqul Islam and Dhaka South City Mayor (DSCC) Sayeed Khokon were on the stage along with Bangladesh Pratidin Editor Naem Nizam, Kaler Kantho Editor Imdadul Hoque Milon and Daily Sun Editor Enamul Hoque Chowdhury. DNCC Mayor Atiqul Islam urged the journalists to raise a social movement for creating awareness among the city dwellers so that they are inspired to practise basic cleanliness for keeping the city clean. 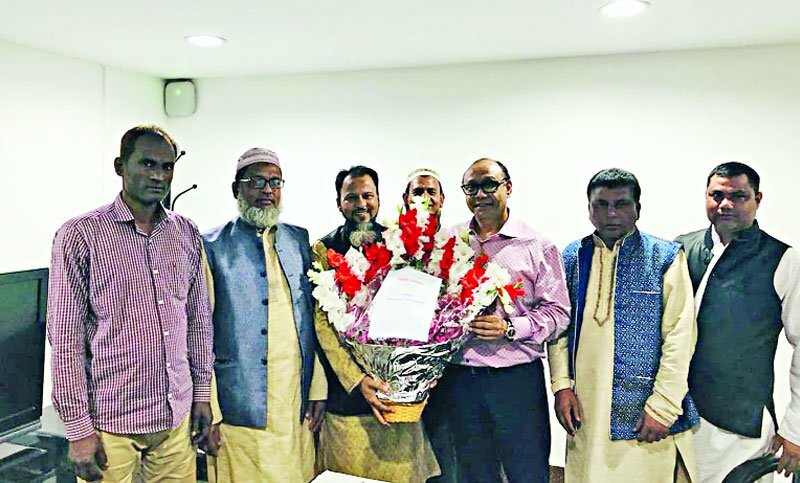 DSCC Mayor Sayeed Khokon appreciated the role of Bangladesh Pratidin for creating social awareness among the people about different issues in the country. The five personalities the newspaper authorities awarded are poet Shamsur Rahman (posthumously), singer Sabina Yasmin, actress Sarah Begum Kabari, actress Farida Akhtar Babita and television personality Hanif Sangket. Tiya Rahman, daughter-in-law of poet Shamsur Rahman, received the award on behalf of her late father-in-law while actress Champa received on behalf of Babita. Actress Sarah Begum Kabari said Bashundhara Group has been contributing to social development greatly through its media outlets. “The business group also can come forward to develop the film industry by producing movies and establishing Cineplex across the country,” the actress said. Singer Sabina Yasmin appreciated the decade-long journey of the newspaper, which, she said, is satisfying the needs of the readers across the country. Television personalities Hanif Sangket said Bangladesh Pratidin has been disseminating trustworthy news every where from makeshift houses to high-rise buildings in the city. Housing and Public Works Minister SM Rezaul Karim, Youth and Sports State Minister Zahid Ahsan Russel, Water Resources Deputy Minister Enamul Haque Shamim, Prime Minister’s former Media Advisor Iqbal Sobhan Chowdhury, Election Commissioner Mahbub Talukder also attended the programme on the day. Former President AQM Badruddoza Chowdhury, Awami League Acting General Secretary Mahbubul Alam Hanif, Joint Secretary Jahangir Kabir Nanak, Bangladesh Nationalist Party (BNP) Secretary General Mirza Fakhrul Islam Alamgir, BNP’s other senior leaders Abdul Moyeen Khan and Zafrullah Chowdhury, Jatiya Party Secretary General Mashiur Rahman Ranga, party President’s Advisor Ruhul Amin Howlader and Jatiya Samajtantrik Dal General Secretary Shirin Akhter also wished the newspaper authorities on the occasion. EWMGL’s newspapers’ Publisher Maynal Hossain Chowdhury, Kaler Kantho Executive Editor Mostofa Kamal, Television channel News 24 In-charge Hasnain Khurshid, Head of News Shahnaz Munni, Current Affairs Editor Samia Zaman and Banglanews24 Consultant Editor Juwel Mazhar were also present on the occasion. From business arena, FBCCI former President AK Azad, BGMEA President Siddique Rahman, America Bangladesh Chamber of Commerce President Atiqur Rahman, Prayas Group Managing Director Pradyut Kumar Talukdar also attended the programme. Among cultural activists, singer Kumar Bishwajit, actor Shahidul Alam Shacchu and Siddiqur Rahman and actress Bonna Mirza were centre of attraction of the audience. From journalist community, Dhaka Journalist Union President Abu Zafar Surja, Dhaka Reporters Unity President Ilius Hossain, General Secretary Kabir Ahmed Khan were present at programme. Among the awardees, Poet Shamsur Rahman, a key figure in Bengali literature, started off with his first book Prothom Gaan Ditiyo Mrityur Aage hit the Bangla literature in the 60s. His masterpiece Bandi Shibir Theke tells the stories of the country’s glorious liberation movement. Acclaimed singer Sabina Yasmin is one of the key figures in Bangla music. She is renowned for her patriotic songs as well as her playback singing. She has recorded around 12,000 songs so far. Sabina received numerous awards, including the Shadhinota Padak and Ekushey Padak. Film star Sarah Begum Kabari vibrated the silver screen for two decades after her debut in the film industry through Subhash Dutta’s Sutarang in 1964. Afterwards, she continued gaining minds of people through her works in Heeramon, Maynamoti, Chorabali and Titas Ekti Nadir Nam. Kabari received many awards, including the Bangladesh National Film Award for Lifetime Achievement. Legendary actress Farida Akhter Bobita came into light through Satyajit Roy’s film Ashani Sangket. Thereafter continued acting in more than 250 films. She was honoured with National Film Award in 2018 for her outstanding contributions to the film industry. Hanif Sanket has a special identity in the country’s cultural arena for picking out the unsung heroes of the society through his popular television programme Ittyadi. Sanket was awarded the Ekushey Padak in 2010. Earlier on March 14 evening, the newspaper started celebrating its anniversary through cutting a cake at its office on EWMGL premises. Bangladesh Pratidin started its journey on March 15, 2010, as a venture of East West Media Group Limited, the media wing of Bashundhara Group, a leading business conglomerate in the country. In its decade-long journey, the newspaper has gained popularity among readers in the country and across the globe. The newspaper is also being published from Europe and America. 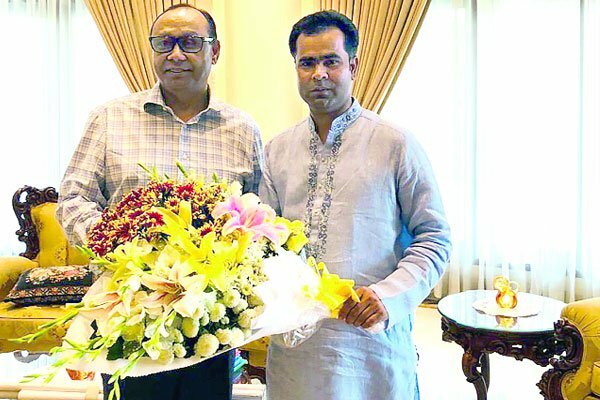 Senior Deputy Managing Director (DMD) of Bashundhara Group Md Belayet Hossain received the award from Finance Minister AHM Mustafa Kamal on behalf of the Bashundhara Group chairman at the annual conference of the state-run bank at a city hotel on Thursday. Bashundhara Group Chairman Ahmed Akbar Sobhan said on Saturday that they want to keep their footprint in all countries across the world through exporting their paper products. “Bashundhara Group will keep its footprint in all countries through exporting its paper products,” he said while addressing the Bashundhara Paper Annual Dealers’ Conference 2019 in the capital. He said once Bangladesh used to import paper from different countries, including China, Sweden and India, but now it is exporting paper to many overseas markets. Bashundhara Paper Mills Limited and Bashundhara Multi Paper Industries Limited organised the conference at the residence of Bashundhara Group Vice-Chairman Safwan Sobhan Tasvir in Bashundhara residential area. Safwan Sobhan Tasvir, Bashundhara Group Director Yeasha Sobhan, Senior Deputy Managing Director (DMD) Belayet Hossain, DMD Md Mostafizur Rahman, Chief Financial Officer Mirza Mujahidul Islam (Sector-C) and Head of Sales (Paper) Md Masudur Rahman were present at the conference. Bashundhara Paper awarded crests and souvenirs to top 10 dealers at the conference. Three of them got Dhaka-Bali-Dhaka air tickets. The winners are M/S Yousuf Enterprise, M/S Mohammadia Paper House, M/S Ahmed Trading Corporation, M/S Monorom Trading, M/S Universal Traders, M/S Sky Traders and M/S National Paper House from Dhaka, M/S Kagoj from Rangpur, M/S Rangunia Store from Chattogram and M/S Samrat Store from Khulna. “The owner of a tiny shop beside a road in a rural village is also a member of our family as he [the owner] is contributing to flourishing of our business by selling Bashundhara products,” he added. He highlighted the economic development taking place in the country and said every individual has been benefiting from the development. Ahmed Akbar Sobhan said the quality of Bashundhara paper is higher not only than other companies in Bangladesh, but also the foreign companies. Many companies from India are importing Bashundhara paper due to its good quality, he added. He announced that he will award 5 katha, 4 katha and 3 katha of plots in Bashundhara residential area in the capital to top three Bashundhara paper dealers. “It’s a dream of all family to be the owner of a plot in Bashundhara R/A for its idyllic beauty. I want that my family members will live in Bashundhara R/A after winning a plot. That will definitely strengthen our bonding,” he said. Speaking at the event, Bashundhara Group Director Yeasha Sobhan said Bashundhara Paper Mills Ltd started its journey 25 years ago with a single unit. Today it has three units apart from Bashundhara Multi Paper Industries Limited unit. Referring to Bashundhara Paper Mills receiving super brand award, she said the success has come due to the leadership of Vice-Chairman Safwan Sobhan. In his speech, Bashundhara Group DMD Md Mostafizur Rahman said once the country used to import paper from India, now many Indian companies are importing Bashundhara paper due to its quality. He said Bashundhara Paper Mills produces various paper products includes Art paper, security paper and currency paper. Masudur Rahman welcomed the dealers and highly appreciated their efforts in achieving the targets last year. He analysed the future challenges and ways to face them to achieve the target.